Koepka, who missed the Masters with a left wrist injury, opened birdie-birdie to grab the lead after playing partner Woodland made bogey at the second, but Woodland birdied the third hole to pull level. The greens are also rolling more quickly, and more to the players' liking, after they were a touch slow Thursday from rain early in the week. Playing partner McIlroy was a shot further back after returning a 67 when the delayed second round was completed on Saturday morning, but the four-time major victor got off to a poor start in round three. If you do that well, and, obviously, in there you're going to make those putts. KEY STATISTIC: On a day made for scoring, 122 players completed the par-3 third hole, and not a single one made a score worse than par. "There were good signs that carried over to today, and hopefully tomorrow it gets better and better". Woodland had a 4-under 66 on Friday morning to reach 130 for 36 holes, breaking the PGA record by one shot, tying the 36-hole record for all majors and giving him a one-shot lead over Kevin Kisner. But he followed with a double-bogey to finish his first nine, added three bogeys and another double on the back, and promptly packed his bags. "I feel like I just played 27 holes, and I only played 11", Thomas said. Koepka ran off three straight birdies after he made the turn and came to the par-5 ninth at seven-under for the round. "You never know what can happen on the weekend". He was at 7 under, three shots behind Woodland with eight holes to play. But it is the first time in 14 tournaments this year that Woods has faced more than 18 holes in one day due to a weather delay. While overnight rain softened the course even more, it also made it play long, leading to several lengthy approaches. Which is why Woods was frustrated by his finish Saturday, by his 10 consecutive pars to close on a cupcake-soft course. 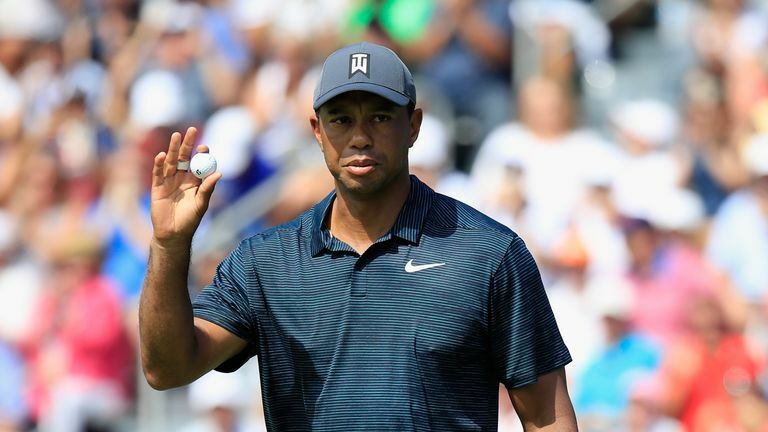 Three weeks ago, Woods trailed the leaders by four strokes heading into the final round at Carnoustie, and found himself atop the leaderboard with eight holes to go before finishing in a tie for sixth.